Config required for transfer features. Credentials stored in-shortcut only. Thanks to u/joereally for help on saving and loading a time-sorted history. 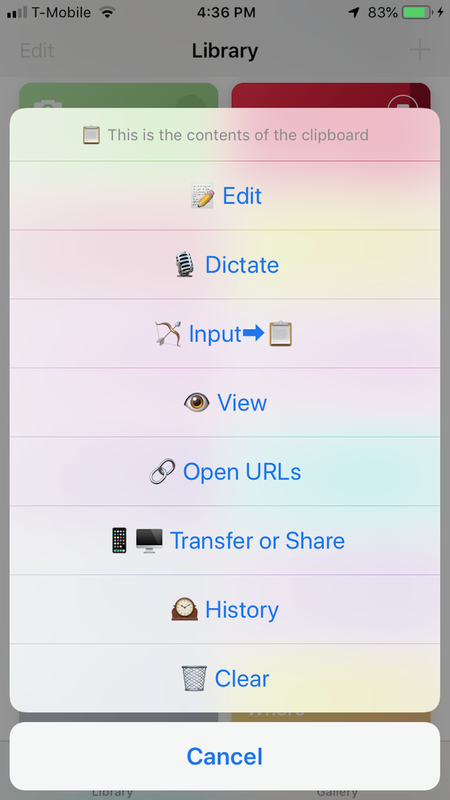 Thanks also to @plasticScript for Clipboard Manager for some ideas about media encoding. Had I know about about that before I started this, I might not have bothered with this. 0.9 - Nov. 8, 2018, 10:18 p.m.
• Releasing this at 0.9 because while this is quite functional as it is, there are areas for improvement and it could use more stress testing. Turns out clipboards are quite complicated things if you're looking to manage more than plain text. • Also looking for testers of the transfer functions on non-Mac platforms.